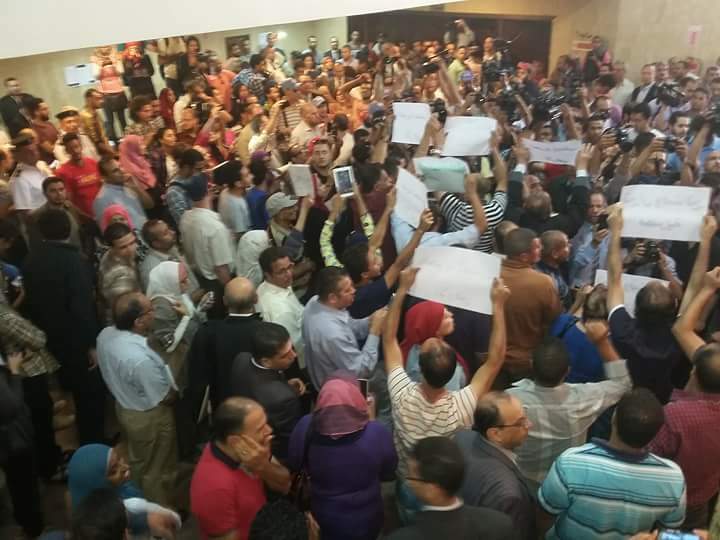 A small protest broke out inside Egypt’s State Council, where lawyers and activists are awaiting the court’s decision in the Red Sea islands case. According to Facebook user Mohamed Nassar, protestors inside the State Council are chanting slogans such as “Awad sold his land,” a reference to an Egyptian song about a farmer who sold his land, and “Bread, freedom, these islands are Egyptian,” which is a play on one of the most popular chants from Egypt’s January 25, 2011 revolution. The Administrative Court is currently looking into an appeal from Egypt’s government against the Court’s decision to annul the controversial border demarcation agreement with Saudi Arabia that resulted in Egypt ceding control of two Red Sea islands. Egypt’s Cabinet announced in April that Egypt and Saudi Arabia signed the demarcation agreement following six years of negotiations and that the two islands, Tiran and Sanafir, fell within Saudi Arabian territory. The announcement quickly sparked widespread controversy, with many lambasting the Egyptian government for carrying out the negotiations “in secret,” and others saying that the government sold part of Egypt’s land in return for Saudi Arabian aid. Last week, however, an Egyptian court acquitted 22 protesters who had been accused of illegally protesting and assembling against the decision to transfer the islands.